ACRLog welcomes a guest post from Marisa Méndez-Brady, Science Librarian, and Jennifer Bonnet, Social Sciences & Humanities Librarian, at the University of Maine. Finding the time and resources to devote to professional learning can be a challenge, especially at institutions that are less geographically proximate to the broader library community. The University of Maine is a land and sea grant institution in the rural town of Orono, where opportunities to engage with peers at other colleges and universities take a concerted effort and may require additional financial resources to participate. While these constraints limit our ability to go to as many conferences as we would like, one day a year our department attends a gathering of Maine academic librarians where colleagues across the state present ideas that generate excitement and lead to further exploration. During the 2016 Maine Academic Libraries Day, Bowdoin College librarian Beth Hoppe made a strong case for using the ACRL Framework to embrace non-prescriptive practices in our teaching, as part of a critical pedagogical approach to working with students. Following this talk, we couldn’t stop thinking: how might we enhance the delivery of information literacy concepts in our own library instruction by more deliberately incorporating critical pedagogy? Motivated to improve our teaching techniques and extend our professional learning, the two of us embarked on a peer coaching project. Over the course of three months we used a study group model to brainstorm, design, and implement a suite of lesson plans that centered the diversity of student voices and experiences in our instruction sessions. Peer coaching is commonly used in K-12 learning environments, and is a technique lauded by the instructional design community for its broad applicability. It is a non-evaluative, professional learning model in which two or more colleagues work collaboratively to: design curricula, create assessments, develop lesson plans, brainstorm ideas, problem solve, and reflect on current pedagogical practices (Robbins, 2015). Although peer coaching can be formalized within a department or unit, we participated in an informal method known as the study group model, where two or more people engage in collaborative professional development for learning (PDL) around a subject of interest. We chose this model because it offers flexibility when it comes to constraints on time or finances, providing a sustainable method for professional development during the hectic instruction schedule of a typical semester. The graphic below illustrates different approaches to utilizing peer coaching for professional learning. To shape our peer coaching project, we consulted instructional design literature, which (1) emphasizes the importance of creating professional learning that is individualized to the specific learning context and audience for the learning, and (2) focuses on content, pedagogy, or both (Guskey, 2009). We also integrated the three key components of effective peer coaching: a pre-conference to establish the goals for PDL; the learning process; and a post-conference to assess the PDL process. The pre-conference in the context of peer coaching consists of meeting to establish PDL goals based on participant interest and applicability to one’s praxis. Our pre-conferencing took a two-pronged approach. First, we established an overarching goal to use the ACRL Framework to develop learner-centered teaching outcomes. Then, we held individual pre-conferences focused on the following Frames: (1) research as inquiry, (2) scholarship as conversation, and (3) searching as strategic exploration. We selected three upcoming instruction sessions (i.e., already scheduled in the library) that would be opportune for trying out new pedagogical approaches. After we set each agenda, we turned from pre-conferencing to the learning process, which involved three study group meetings to design our lesson plans. In advance of each meeting, we selected relevant articles to read and reviewed two to three corresponding lesson plans in the Community of Online Research Assignments. The lesson plans we chose not only engaged with the Framework but revolved around students’ interests and experiences, which helped us consider teaching techniques that were non-prescriptive in practice and drew on critical pedagogical concepts. We then used the scheduled meeting time to adapt these lesson plans to fit the goals of our upcoming instruction sessions. The first lesson plan involved a teach-in that asked students to share their decision-making process when searching for information in both open and licensed resources (ACRL frame: research as inquiry), and was targeted at an upper-level undergraduate communications and marketing course. The second lesson plan focused on deconstructing citations and reverse engineering bibliographies, and was designed for an upper-level undergraduate wildlife policy class (ACRL frame: scholarship as conversation). The third lesson plan used one piece of information from a vaguely-worded news article as a jumping-off point for finding related information across various media, which we co-taught for a student club on campus (ACRL frame: searching as strategic exploration). Although these lesson plans were designed for specific contexts, they are broadly applicable across disciplines and academic levels. We further engaged with critical pedagogy in a post-conference that succeeded each study group meeting. In the peer coaching context, the post-conference acts as an assessment of the study group experience for us (the learners) and emphasizes the role of self-reflection in gauging our own learning. Building on the work we started in the classroom (via each lesson plan), we took a feminist pedagogical perspective to self reflection that involved open-ended questions about process and practice, and addressed our own PDL outcomes. We hope to continue using peer coaching in other areas of our praxis. 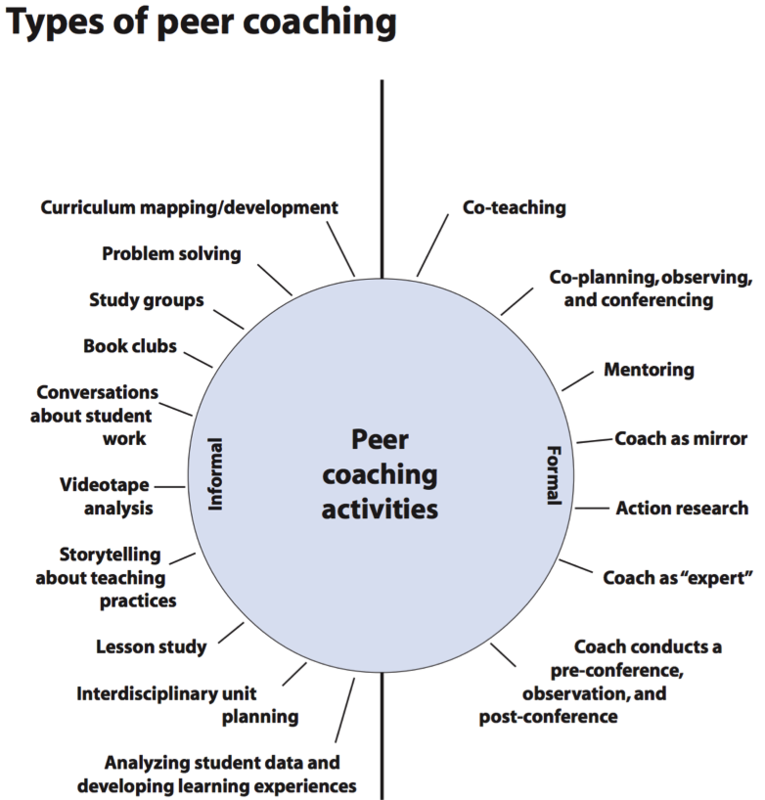 Peer coaching offers a low stakes, low-cost option for professional development that leverages existing resources, draws on the interests and skills of colleagues, and allows for higher frequency contact among participant learners (versus a traditional yearly conference). We also found that the informal structure of the study group model supports flexible implementation and facilitates home-grown continuing education opportunities that are targeted to specific issues we face at our library. So often, we absorb ideas at conferences, webinars, or through informal conversations. Yet, actualizing these ideas in our own institutional environments can be challenging due to issues like time, motivation, and support. Next time you discover a novel approach or way of thinking about your praxis, we encourage you to try peer coaching! We’d love to hear from you about how you use this professional learning strategy in your own environment.